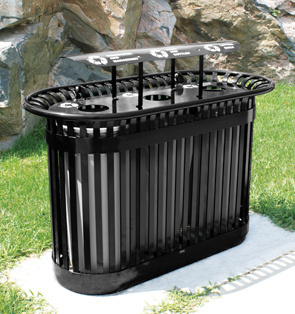 This convenient design features your choice of a two or three unit recycling station with an attractive flare top surrounded by 1-1/4" steel bar pickets reinforced with a 3" metal band. Four steel bars form a grid at the base of this recycling station to support the included liners and keep them off the ground. This receptacle comes fully welded and no assembly is required. 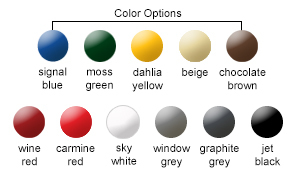 Available with choice of commercial grade funnel lids, a hinged steel lid or rain shield lid (custom decals available upon request). Plastic liners included. 2 or 3-Unit Stations Available. The state of the art finishing process used on the recycling station combines the application of an 'Electrocoat Zinc Rich Primer' with a durable polyester powder-coat top layer to ensure every crevice and joint is completely sealed, providing full protection against	corrosion and weathering. 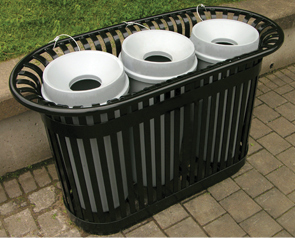 Recycling stations are finished in either a gloss or textured polyester powder-coat finish.